As a “grown up” I was first a professional singer and then turned to the classroom, spending most of my career teaching music, art and drama. I am currently a jazz vocalist around town and I am directing the KCP youth production of HONK JR!, which is to be performed at Georgian College Theatre this November. Since retiring from full time teaching I have returned, with fervour, to expressing myself through the visual arts in addition to my other passions. From a young age I shared my mother’s art supplies and was immersed in fine art experiences and workshops. As a result, painting has always been an expressive and creative form of communication for me. I find colour exciting and I love how it flows from my brush onto the canvas bringing my intentions to life. When I am painting it seems my colour choices “just happen”. I love the brilliance of the hues and inertly I try to capture the energy of my subject with the colour. 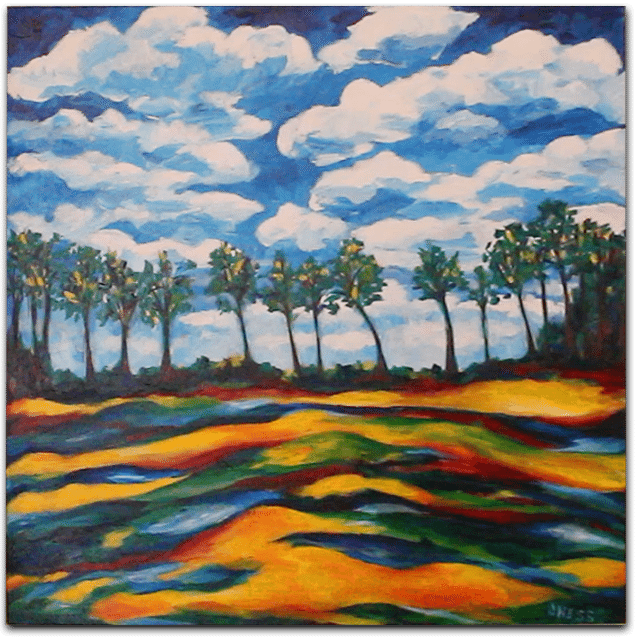 I paint landscapes, still life, and abstracts mostly in acrylics and oils and often on larger canvases. I have just begun to experiment with mixed media on canvas and investigate the art of mobiles and distressed furniture. All of this ultimately makes me who I am. I have over fifty pieces presently hanging at “The Creative Space” which is a co-working space at 12 Dunlop St. E. in downtown Barrie. You are welcome to go in and view them at any time. Sincere thanks go out to the BAC for this opportunity to be the featured artist for October.